We've all been there. You're standing in the break room minding your own business and you decide to open the refrigerator door. Suddenly, without warning, you're hit by a dozen different odors of various foods and strange substances. The questions start racing in your head... How long has that box of Kung Pao chicken been in here? Three, maybe four weeks? Why would someone leave an opened can of tuna? And, why hasn't anyone cleared this out? If this scenario sounds familiar to you, then you've experienced an economic principle known as the Tragedy of the Commons. But what exactly are the social reasons behind this? And how can we go about fixing it? To answer these questions, let's first dive into the definition, and then explore a few examples. Tragedy of the commons is the situation in which common resources shared by a collective group are negatively affected by the selfish behavior of the individual's self-interest. British economist William Forster Lloyd first exemplified this phenomenon in 1832 through his observations of a commonly shared pasture of land. Free for anyone to use, farmers were allowed to bring their sheep and cattle to an open pasture for grazing. As no single person privately owned the land, farmers could reduce costs and freely sell wool and cattle to the neighboring residents. Initially, this was an effective system. However, not too much later, farmers from other regions quickly caught on to this, and made their way to the open grassland. Due to the excess number of animals in the finite space, the common resource was exhausted to the point where the pasture became completely barren. The farmers were no longer able to use the space, and the neighboring residents who relied on the wool and cattle were negatively affected. Based on these observations, Lloyd concluded that individual's seek to maximize their own self-interests, even at the expense of the collective group. While it would be beneficial for the farmers to cooperate and take-turns for the sake of the greater good, invariably the farmers will choose to satisfy their own needs before anyone else's. So what can be done to fix this problem? The easiest solution is to enforce regulation. In order to restore the commonly shared pasture, the government would need to limit how many farmers can use the land. This would prevent the surplus of individual farmers from accumulating past the point of over-exhaustion. However, there is the potential for the smaller group to increase the supply of their sheep and cattle, resulting in the same problem. This leads to more regulation, such as limiting the quantity of animals. While an effective approach, this method may seem like too much regulation. Another option is to privatize the land. This would result in decentralizing the shared resource, and ultimately eliminate the tragedy of the commons altogether. In some instances, the tragedy of the commons is less apparent. Let's say, for example, a small software company has about 50 employees. Everyday, these 50 employees punch in and out using a finger sensor biometric clock. Initially, the system works great. The sensor easily acknowledges the fingerprints, and everyone can quickly clock in or out. Life is good. However, as with any commonly shared resource, the clock will eventually start to diminish. If the clock isn't cleaned regularly, the sensor will become less reliable. And if employees press too hard on the system, the hardware will face greater wear and tear. Eventually, this leads to the replacement of the clock altogether. In this scenario, the tragedy of the commons predicts that employees will utilize the clock to maximize their own self-interests, i.e. punch in and out. Given that none of the employees actually own the clock, there is no incentive for them to take the time to care for it. In turn, this leads to a quicker degradation of the system itself, and ultimately costs the company more money. Like the shared pasture example, in order to remedy this problem there needs to be greater regulation and decentralization. A simple solution for a manager would be to establish a regular cleaning schedule among the employees. For example, this week Mark is in charge of wiping down the time clock, next week is Sarah... etc. This way, the clock is being maintained over time. Another idea is to place a sign above the time clock encouraging employees to be careful with the system, such as not pressing too hard. While these are useful ideas for increasing the longevity of the hardware, the clock itself is still a commonly shared resource, and the tragedy of the commons won't be eliminated entirely. In order to completely solve this issue, the resource would need to be decentralized. For example, switching to an online time clock. This allows employees to punch in from a variety of sources, whether it's from their computers, phones, or tablets. 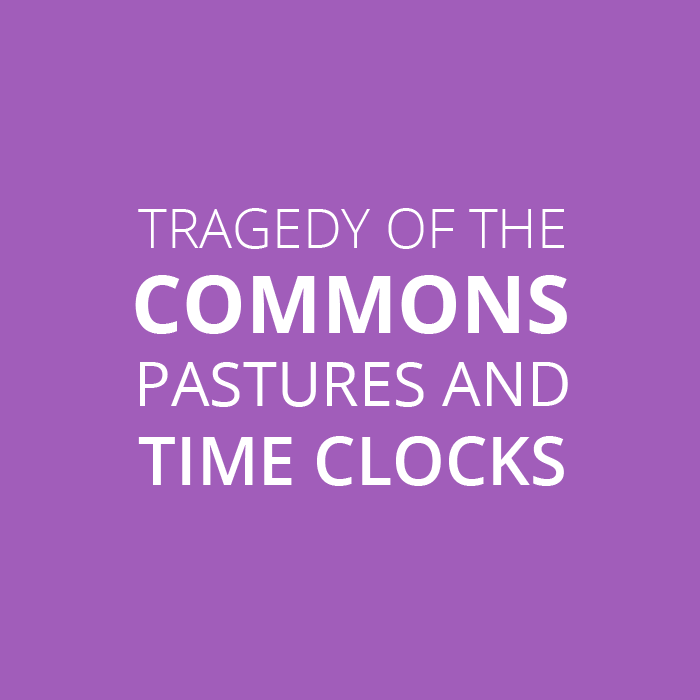 Given that the clock would no longer be a commonly shared resource, the tragedy of the commons would no longer exist! To recap, the tragedy of the commons is a social dynamic in which individuals act upon their own self-interests at the expense of the greater good. Based on these examples, it's easy to see how the break-room refrigerator turns into such a scary place! As a way to mitigate these negative effects, it's best to regulate and decentralize. If you're interested in learning more about the Tragedy of the Commons, check out this article from the Library of Economics and Liberty.